When you're working with stainless steel, you want your final product to look as professionally done as possible. As such, you need to smoothen and polish the steel. This can be done by moving the grinder as gently a possible over the welded bits, so that they match the rest of the steel. When you're repairing your vehicle for collision repairs, you probably have to strip off the pain to work on the bare metal. Die grinders can come in handy especially when you want to get rid of paint in the smaller areas that may be hard to reach using a sander. Alternatively, to remover the metal sheet that needs replacing, you can install a cutting wheel onto the grinder. Although die grinders are often used for metal works, they can be used to smooth anything else down. In fact, many woodworkers like to use die grinders to smooth out wooden surfaces to produce a more professional finish. You can substitute sanding for die grinders to hasten the process. Die grinders will also work perfectly on plastic surfaces too! Unlike larger grinders, die grinders are meant detail-oriented work, and are not intended for rough cutting. they are among the smallest types of grinders, and their high speed and wide variety of tips make them suitable for adding details and finishing up a work piece. Since the tools are rather simple, there are just a few options available to choose from. These options come in terms of the type of tip you need on the die grinder. Here are some of the things you should consider when buying a die grinder. Die grinders are often designed to allow the user to control the speed, though they are commonly used at full speed. However, for those looking to cut softer materials like plastic and wood, the variable speed will come in handy, as it prevents over-cutting or even the destruction of the workpiece. ​Just like with other power tools, cordless die grinders are now entering the market, offering users great portability and ease of use. Although cordless die grinders are usually longer than the pneumatic ones, not having to drag the power cord or air hose around allows them to reach into more areas, some of which pneumatic die grinders simply can't. ​Cordless grinders are often used on remote jobsites by contractors than by people working in a shop. Of course, the benefit of working off a battery isn't apparent when working in a shop with power available throughout. Moreover, cordless die grinders require stopping to change the battery periodically. 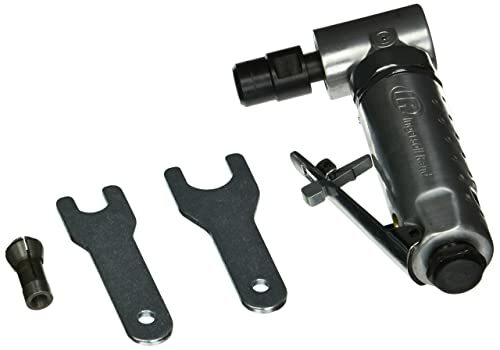 This is an economical, durable angle die grinder offering from the Ingersoll-Rand Company. The tool I ideal for general purpose grinding, with its claim to fame mostly based on its host of incredible features in a compact package. For instance, its design and shape allows the user to access the tightest of spots, enhancing access to features like porting, polishing, breaking sharp edges, de-burring, and even grinding from virtually anywhere on any type of surface. The durable ball-bearing construction reduces the vibrations, and makes it a durable, well balanced power tool. The safety lock throttle is quite easy-to-use, and works well in preventing any accidental startups every time. It's a decent piece of power tool with wonky finger and hand contortion needed to start the unit. This is presumably because of its startup failsafe feature. The unit can spit out water from your compressor, meaning it might be a good idea to invest in a moisture trap. 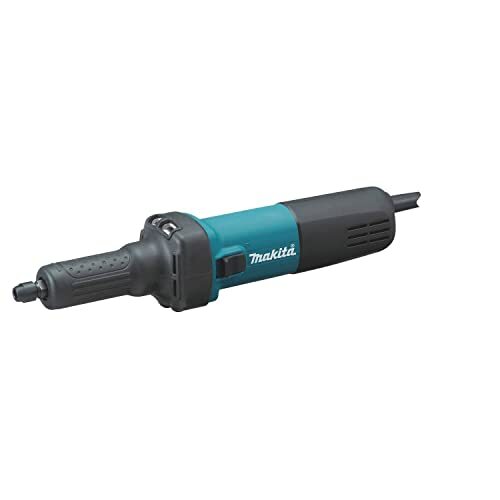 The Makita GD0601 die grinder has conveniently located, easily operable slide switch. It comes with a barrel-grip slim design, and is powered by a 25,000 RPM electric motor. The compact package only weighs 3.7 lbs. which is quite impressive considering its features. To protect the internals and ensure a longer tool life, the Makita GD0601 has a strong, smart, labyrinth-style construction with seals to keep off the dust and debris. One Amazon user claims they got a cheap import, which got hot after five minutes of use. Another claims that it's a well-built, quality tool, but their product couldn't rev up to the desired speed due to bearing problems. However, with a rating of 4.3/5 stars, this is still a great product and in many respects a good buy. 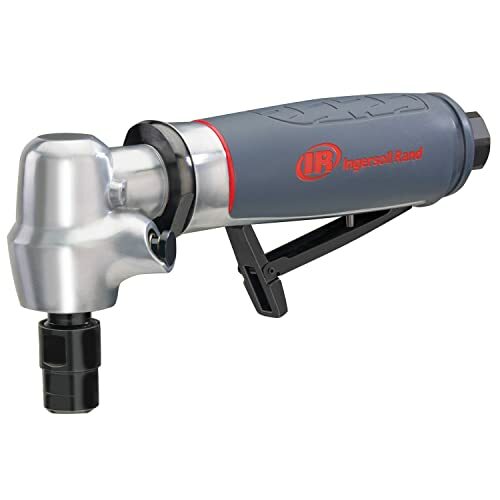 In the 5102Max Pneumatic Angle die grinder, Ingersoll Rand combines comfort and incredible power in a compact package. This grinder delivers all the power you might need for various applications. It's powered by a 0.4 HP motor, and comes with a lube-free design that eliminates the possible contamination of your work environment. With it enhanced grip and a low profile throttle lever, the Ingersoll Rand 5102MAX provides extended run-time capabilities without any signs of fatigue. A 20,000 RPM, 0.4 HP motor that delivers all the power you need for most kinds of applications. Comes with a spindle lock feature that enables faster abrasive change overs. 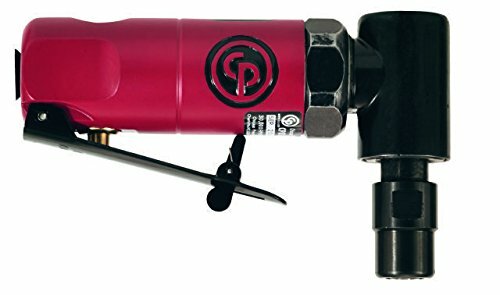 The Pneumatic CP875 is an economical, mini-angle die grinder, that has become extremely popular power tool. It's has a compact, lightweight design, with a 90-degree angle head that allows for easy maneuverability and flexibility in the hard to reach and confined areas. It comes with a lock-off throttle to prevent any accidental startups. It's ideal for use in porting, smoothing, high speed blending, polishing, grinding and deburring in tight spaces. Comes with a lock off throttle that prevents accidental startups. The product can't last long in a high production shop. A water separator is needed in front of it to make it more durable. 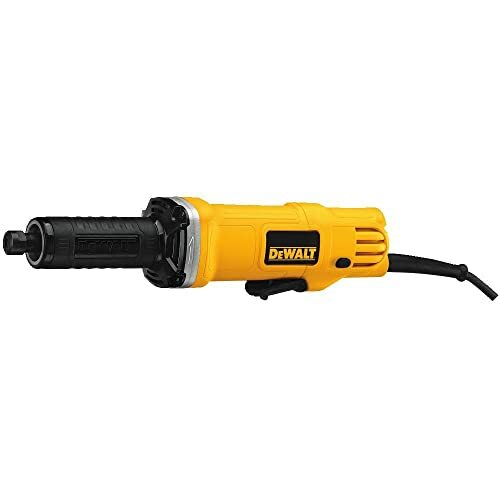 The DWE4887 Die Grinder from Dewalt comes with a 25,000 RPM, 4.2 Amp motor that offers high speed and power for all your 1-1/2" grinding needs. The grinder is designed to accommodate both AC/DC capacity, making it applicable off the welding generators and machines, for increased versatility and productivity. The paddle switch and the lock on button allows for easy grip, and its precision 1/4" collect enables it to hold a wide range of accessories for tasks such as polishing, grinding wood, metal or plastic, enlarging holes, and removing dust. The grinder is also backed by 3-year warranty from the manufacturer. Has a convenient paddle switch and a lock on button for increased grip. The grinder can be uncomfortable to hold, meaning that it's less ergonomic than most of it's competitors. Can be a bit bulky, mostly because it's awkward to hold. The Ingersoll Rand 301B Air Angle Die Grinder offers the most value for your money, considering its durability, powerful motor, versatility, and the price point. it's our best die grinder for 2018.